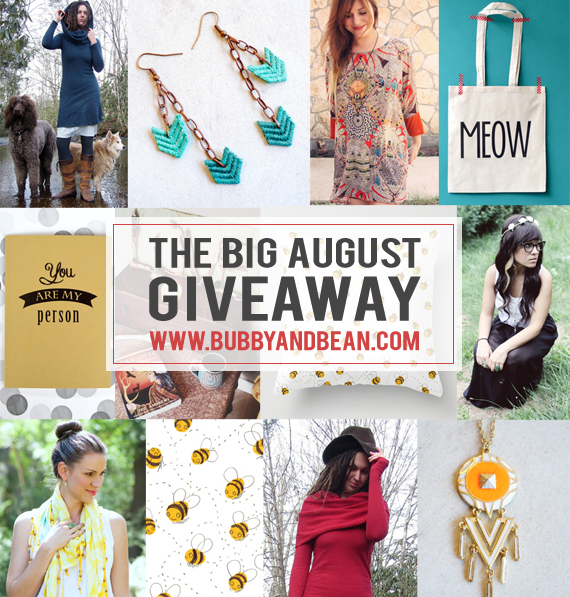 Bubby and Bean ::: Living Creatively: BIG AUGUST GIVEAWAY // Win a Prize Package Worth $300! BIG AUGUST GIVEAWAY // Win a Prize Package Worth $300! It's Friday! Let's celebrate! How about with a huge giveaway of goodness from handmade and independent businesses and blogs? I've teamed up with several of August's large and medium sponsors to put together an incredible prize package that includes clothing, accessories, paper goods, home goods, shop credits, and blog ad space. All together, it's valued at nearly $300 - and one lucky Bubby and Bean reader is going win it all! Then just leave a comment telling me your favorite color. That's it! 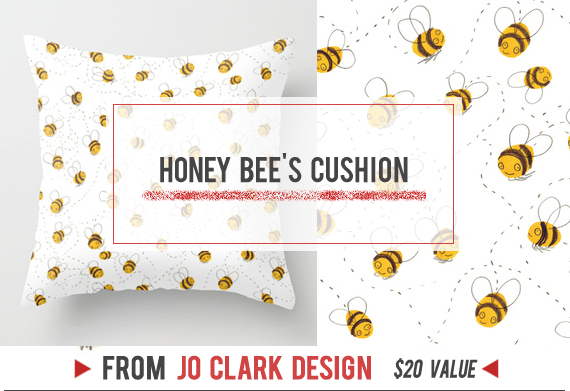 Visit any of the shops from this giveaway (White Bear Accessories // Gaia Conceptions // Always Wear Your Invisible Crown // Jo Clark Design // Roots & Feathers // Little Tree Vintage) and list your favorite item(s). Follow/subscribe to any of the blogs from this giveaway (Invisible Crown // Shannon Hearts // Little Tree // Gaia Conceptions // White Bear // Roots & Feathers). Favorite any of the Etsy shops from this giveaway (Little Tree Vintage // Always Wear Your Invisible Crown // White Bear Accessories // Roots & Feathers // Gaia Conceptions // Bubby and Bean Art). This giveaway goes through August 29th and is open to Bubby and Bean subscribers worldwide. The winner's name will be chosen randomly and announced shortly after. Please make sure that you check back and/or that there is a way to contact you if you won. Thanks again to our August sponsors for contributing such great prizes! Good luck! I looked at the Always Wear Your Invisible Crown, I love(!!) the "I'll be there for you when the rain starts to fall" postcard and "Write the book you want to read" journal!! Liked on facebook- sorry if all these comments are annoying! I understand that it would be!! Fantastic prizes! Thanks for the chance to win! 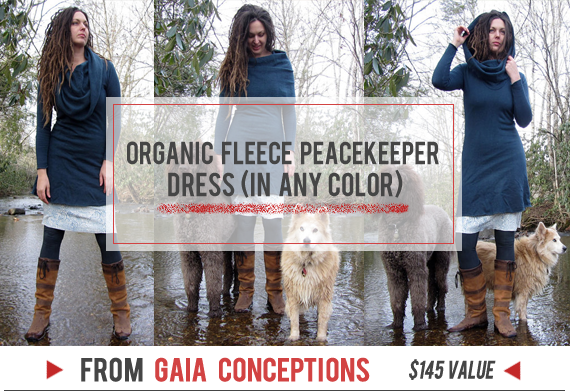 I love everything from Gaia Conceptions, but particularly the migration tunic. I am following on GFC and my favorite color is green! Do I get a separate entry for everyone of my favorite colors? HA! Default answer is yellow!! Following via gfc and my fav color is teal! The "Skylar" brass bird necklace on Roots & Feathers is beautiful! I liked all of the shops on Etsy that I hadn't already liked! I love all of the postcards from "invisible crown"! I am a Twitter follower of B&B! I'm loving the colour Coral atm :) Coral it is! Favourited B&B Art on Etsy! My favorite color is turquoise! Just started following via GFC. I favourited The Invisible Crown on Etsy! Extra entry - already following on Pinterest, user name randomcreative. Extra entry - just started following on Instagram, user name randomcreativeart. 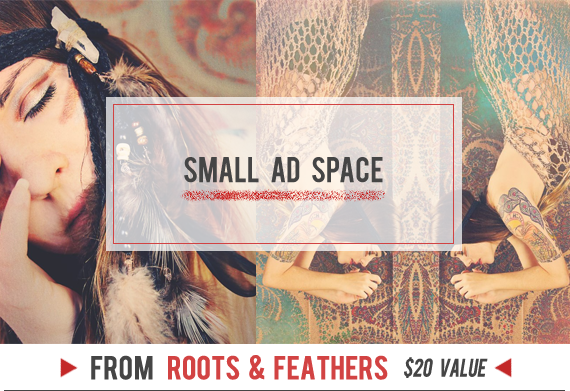 I favourited Roots & Feathers on Etsy! Following you on Bloglovin and my favorite color is mustard! I liked your page on Facebook and my favorite color is mustard! Following you on Instagram and my favorite color is mustard! And I'm Following you on Pinterest and my favorite color is mustard! My favorite item from Roots and Feathers is the "skylar. a beaded brass bird in flight necklace." 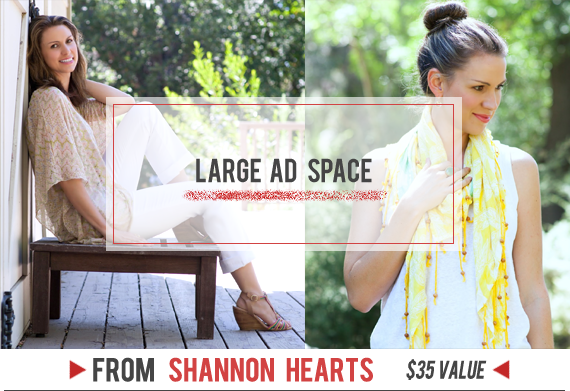 I'm following the Shannon Hearts blog with GFC as "Danielle/See Shop Love!" 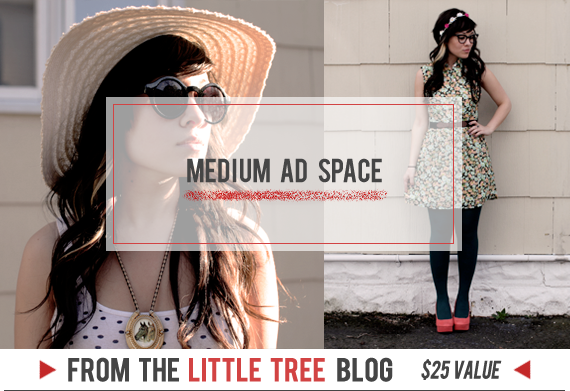 I'm following the Little Tree blog on GFC as "Danielle/See Shop Love!" This week it is blue. I follow White Bear's blog at The Royal Bohemian. Of course, I'm a fan of Bubby and Bean on facebook! I follow you on Pinterest with username justByou. My favorite color is petrol! i follow shannon hearts blog! 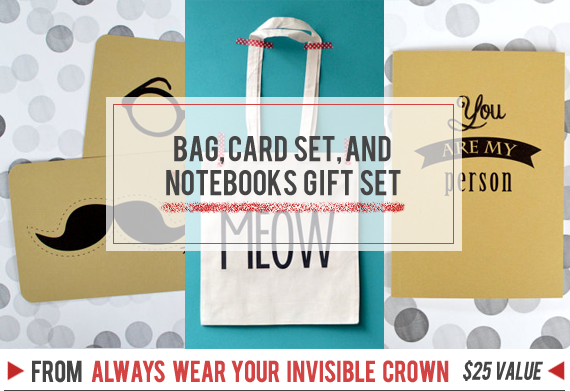 a couple of my fave items from the invisible crown shop is the Harry Potter spells notebook and the hola postcards! I follow on GFC and Bloglovin'. I favorited White Bear Accessories. I follow White Bear on GFC. Liked Bubby and Bean on Facebook as Jennifer Truong. Followed on Pinterest as Jennifer Truong. My favorite color is forest green! GFC follower! I love red. Purple's my favorite color & I follow you! And White Bear Accessories' lace necklaces are my favorites from their shop. I follow your blog, of course. My favorite color is any shade of green. My favourite colour is rainbow. I follow on Google Friend Connect, and my favorite color is coral. My favourite color is blue! I click the Facebook Like button below to like this post on Facebook. I often change my mind about my favorite color. It always depend what mood I am. At this moment I fascinated by mint green. From White Bear Accessories I love, love, love Yellow Mint Green and Aqua Blue Leaf Lace Necklace. From Always Wear Your Invisible Crown I like Friends print - I'll be there for you - the Rembrandts. From Roots & Feathers I really like emmalye. a copper and gold geometric arrow necklace. I follow White Bear on Facebook. I follow Bubby and Bean on Etsy for some time now. I love Chevron Lace Earrings in Teal Green from White Bear Accessories . I favourited White Bear Accessories on ETSY as NoorUnNahar . I follow Always Wear Your Invisible Crown on Etsy. 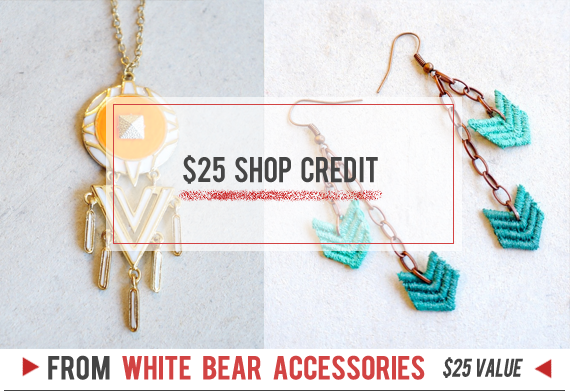 I follow White Bear Accessories on Etsy. I follow Roots and Feathers on Etsy.